After the rains of July caused the annual cricket match between the Parish Council/Millennium Trust (PC) and Ebor Players (Players) to be postponed, the match was finally played on Sunday 2nd September. Despite leaden skies, the rain held off and there was no need to apply Duckworth-Lewis unlike in the more notable match taking place at Headingley. 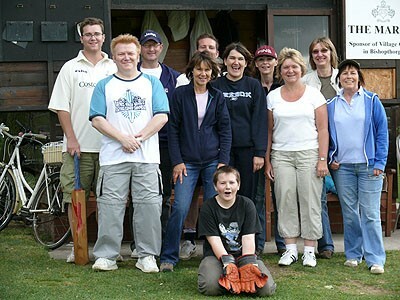 After winning the toss, Players captain Lisa Thornton put the Parish Council team into bat. 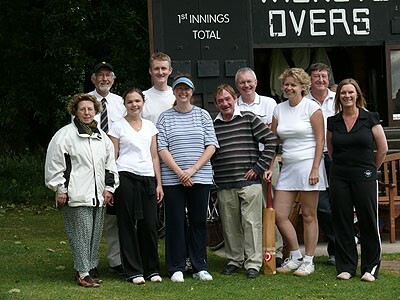 Despite a good start by the PC’s best player Chris Dale (10 not out) having hit 2 boundaries, wickets began to fall with Jo Bewley out for a duck caught Tim Bruce off the bowling of Thornton, closely followed by Cath Bruce who made a solid 4 before being caught out off the bowling of Julia Sykes. The runs began to dry up as Liam Godfrey & Carole Green occupied the crease and the Players put their on best bowlers, newcomer Chris Todd and ‘cricketer’ Ben Smith. Having seen off most of the bowling, Godfrey was then cleaned bowled by Smith for 1. Green followed closely after being caught by Alistair Dunn off the bowling of Malcolm Higgins. However things began to turn again as a very fruitful partnership developed between Charlotte Drummond (daughter of one of last years heroes) and whose father and boyfriend took a turn at umpiring this year, and PC Chairman Stewart Harrison. The latter having to retire on 12. Martin Dudley and Cayley Godfrey finished off the batting making 1 run each. However, a total of 44 never looked like being enough. Choreographer Chris Higgins and Ben Smith opened the reply for the Players, but tight bowling from Harrison & Dudley kept them pinned down. Then Smith holed out to a brilliant running catch from Dale for arguably the best moment of the match, off the bowling of Godfrey. Solid contributions from Thornton and Tim Bruce keep the score ticking along and both retire undefeated Then, the match swung again as Chris Gajewicz is almost run out but is saved by chaotic fielding from the PC team, but in the process she pulls a muscle and has to leave the field. Each year produces its heroic victim, and none of us are getting any younger. Then Julia Sykes who has scored a very respectable 3 hits her own wicket. Malcolm ‘Hurricane’ Higgins gets a quick 6 runs but the overs are running out for the Players. Enter new boy Chris Higgins, another proper cricketer we could tell because he actually placed the ball rather than closed his eyes and hoped for the best. 10 runs later he is forced to retire. But now the Ebor Players have only one batsman left; Alistair Dunn, and he is joined by a non batting runner. 4 runs are needed with only a few balls left. Dunn hits these in 1 stroke of the bat to win with a boundary and secure himself the Man of the Match award. So victory this year like last by 1 wicket but this time it’s the Ebor Players who take the honours. Its now one each and let’s do it all again next year. Thanks must go to Bishopthorpe Cricket Club for letting us use their pitch and equipment, to the umpires and scorers for giving up their time and of course to the teams and spectators for turning up. Ebor Players win by 1 wicket.